Elevate your vacation year-round with this 4 bedroom, 3 bath home just 3 blocks to the base of lifts 1 and 10. 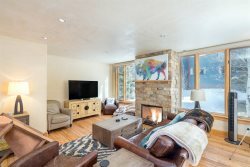 Located in the Meadows Area of Mountain Village, 6 Spring Creek is a spacious 4 bedroom, 3 bathroom home just a few blocks from the base of Lifts 1 and 10. This home is a great option for families, groups, skiers or golfers and is ideal year-round. I really did enjoy the stay. Great staff Information, everyone answered my calls and texts and questions promptly and accurately. The shuttle in mountain village is awesome. Thank you for having a whole kitchen ready for cooking! We love cooking breakfast and it was nice having everything there ready. It was such a pleasure working with this company from planning the trip, to arriving at our home away from home. The cabin was completely set up with all the kitchen amenities you could possibly want for cooking your family meals, towels and sheets galore and even an impressive board game collection. The entire trip was nothing short of magical. Can't wait to book our next trip with latitude 38. Thoroughly enjoyed our stay. We couldn't ask for more.Everything was thought of, plenty of room, lovely quiet spot and nice and warm! We were very satisfied with the property on 6 Spring Creek Drive. The staff at Latitude 38 were friendly, professional, and went out of their way to make our vacation the best experience possible. Emily was very helpful in handling all aspects of our arrangements prior to our visit and Kevin was there to greet us and help us acclimate to the property upon arrival. I would definitely recommend this property to anyone who is considering it! By Colorado State Law, occupancy cannot exceed the maximum amount of 9 for this property at any time.